A compact guide for Czech Republic especially for short-term travellers. Advices for best accommodation and dining options. There lies a dignified land, witnessed lots of pain throughout the history, had tears in its eyes but now stands upright, shining bright and mesmerizing the people from all over the world with its magic continuously. Czech Republic is a unique country with its courage, proud and dignity. Gothic, Romanesque or Renaissance touches can be seen in every corner of the country at a glance and you can feel the classic music notes flying around. Prague’s legendary beauty and the romanticism, Karlovy Vary’s both natural and structural attraction, Jesenika’s hot springs, Moravia’s fertile soil and vineyards and Kutna Hora’s mysterious church of bones will impress you head to the bone.. A country of many faces, Czech Repuplic is vast in terms of art, nature and history. Explore the little, picturesque villages, experience the amazing nightlife, dine in the 600 year-old restaurants, and taste from over 500 kinds of beer. Czech Republic has something that meets all kind of desires. Czech Republic also boasts with its prominent figures like Franz Kafka, Milan Kundera, Milos Forman and Josef Sudek. Do not you also think that wandering around in the same streets and drinking your coffee at the same cafés with them will add up to your excitement? Meet the great masters' souls in Czech Republic. If you are ready for a journey to witness the past, experience the present and create the future as you may hear many times about Czech Republic, come to live the dream in the flesh. Czech Republic whose capital city is Prague, is located in Central Europe and it is in the middle of Germany, Poland, Austria and Slovakia. 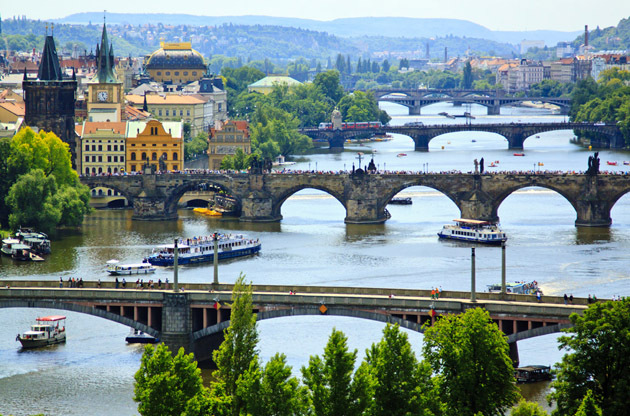 The capital city of Czech Republic, Prague is famous for its legendary beauty and the romantic atmosphere. Old Town, Astronomical Clock, Charles Bridge and Vltava River that divides the city into two will open up your horizon. With the picturesque gothic architecture and smell of history, Prague is the most attractive point in Czech Republic with no hesitation. The center of Bohemia, Kutna Hora can be considered as a competing city with Prague in terms of economy, culture and history. Being the city that is rich in silver, Kutna Hora has an impressing Gothic architecture. St Barbara Church, Bone Church and Virgin Mary Church are worth paying a visit. The city of baths, Karlovy Vary is famous for its film festival and picturesque buildings that will make you feel in a fairytale. It is 80 km away from Prague and will amaze you to the bone. Czech Cuisine can be considered as under the effect of German, Hungarian and Polish cuisines. However vegetables also play an important role in this cuisine, it may not fully satisfy vegetarians since it is based on the meat. Meat dishes are generally served with sauced rice or potatoes. We can say without hesitation that the portions are generous. Czech beer is simply the best in Europe with over 500 kinds, so get ready a beer feast. Beers are served in one-liter glasses and they are cheaper than the water. Becherovka is also a famous alcoholic drink in Czech Republic that is made of cinnamon, aniseed and 32 different herbs. Used for medical treatment once, Becherovka is a world renowned alcoholic drink that contains 38% of alcohol. You can make sure if your country is exempt from visa or not by clicking the list of states whose citizens are exempt from visa requirement on Ministry of Foreign Affairs of the Czech Republic’s official website. Boasting with its 235 hotels with modern facilities that can host large scale meetings, Czech Republic is one of the most preferred hub for international events in Europe especially in the last years. According to ICCA’s statistics, in 2011, Czech Republic was home to 122 international meetings. Prague, the capital of Czech Republic is the leader city in organizing the large scale events like symposiums, fairs, exhibitions, tradeshows, conferences and congresses thanks to its developed infrastructure and favorable venues with modern facilities. Defining itself as “traditionally modern”, Czech Republic continues to be the shining star of the international meetings sector.